It's dark, but does it matter? Here's a little sidetrack, unrelated to much of anything else I write. I don't know why I think about these things; no doubt something I read stuck in my head and got wheels turning. 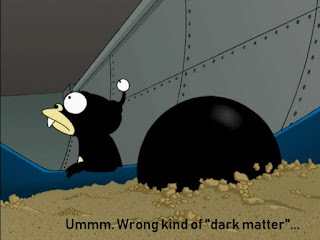 It's about "Dark Matter". You, know, the "stuff" that the evidence points to as making up most of the Universe, but which can't be detected in normal ways (other than observing its apparent gravitational effects on a galactic scale and above). What is the evidence for dark matter? Could all those pieces of evidence be explained by a force divorced from matter? Maybe a result of the natural topography (on a large scale) of spacetime itself, rather than a sign of something else sitting in it? Maybe it's a force which mimics gravity, but isn't a spacetime curvature caused by matter. In other words, it acts very much like gravity, but isn't gravity. Maybe it's a type of "orphan gravity". No, I don't know. I'm not smart enough to know, haven't had the training to know, and probably don't have time (or the ability/equipment) to figure it out. It probably doesn't matter, anyway. It's just one of those things I think about. Reminder: I have a dark financial future. Does it matter?